ADDICTIVE....that's the only word I can think of to explain it. I started it yesterday morning, and couldn't put it down. I was at work slipping in the back room with the book just to read another paragraph here and there. I stayed awake all night to finish it. I HAD TO! 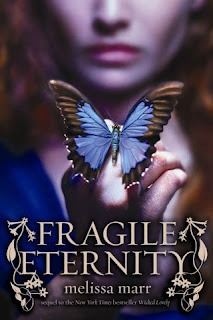 The best thing about Melissa Marr's books? I find myself rearranging characters and loyalties to make everything end up happy. I would tie it all up nice and neatly, but Marr doesn't do that. She isn't afraid to make the world difficult for her characters and her books are so much better and longer-lasting for it. There MUST be another book in the works...there is MUCH more to tell...I can't wait to find out!